The Museum School offers continued learning programs for the fully grown, but still growing. Even as adults, learning to think creatively deepens our understanding of the world and you don’t have to be an artist to enjoy getting your hands dirty. From pottery, to painting and drawing, printmaking, glass fusing, and even alternative art forms like puppet-making and shell engraving, The Museum School encourages creative expression through anything we can get our hands on. No experience is required. All workshops are suitable for ages 15 and up, unless otherwise stated. We also offer professional development workshops for artists on topics such as building a website, grant writing, social media, and other skills. By keeping up with the latest trends and best practices, we support local artists who want grow their business in a constantly changing market. 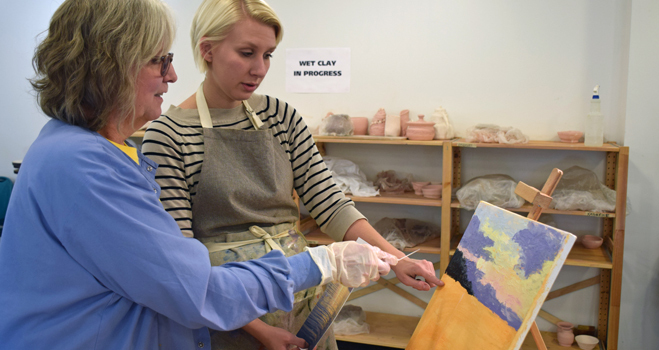 MMofA offers adult pottery classes taught by professional artists. With classes of different skill levels, MMofA has something for new students or students who want to broaden the skills they already have. 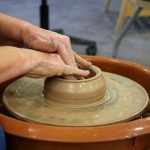 From throwing on the wheel to hand building to open studio time, there is a class for everyone. 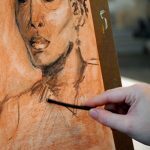 Expand your 2D skills with drawing and painting classes at MMofA. Participants have a variety of options using different materials and subject matters in each class. With live demonstrations or model poses, each class allows for students to learn from their surroundings to create something wonderful. For those interested in other art forms, MMofA is continually offering new and exciting classes to try out. 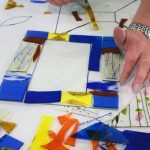 From making one-of-a-kind textiles using Batik Art to jewelry making or glass fusing, these classes help students develop new skills using unconventional materials.